What's in the box (hits)? 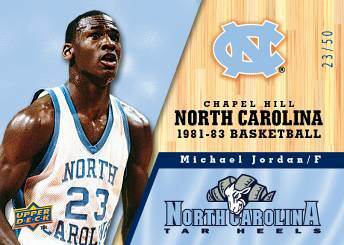 Look for Autograph Cards of UNC greats like Michael Jordan, Kenny Smith, Phil Ford, George Lynch, and many more! The most storied program in the history of College Basketball gets its first ever Upper Deck Set designed to highlight and pay homage to North Carolina's illustrious basketball history. Includes North Carolina Basketball Legends like Michael Jordan, Kenny Smith, Phil Ford, George Lynch, Ty Lawson, Eric Montross, and more! Every pack has a themed insert card! Two (2) 3-D Inserts per box! Look for The Jordan Years inserts and 1 of 1 Jordan Autograph parallels! Collect the entire UNC Basketball set!